Kielbasa (from Polish kiełbasa)[a] is any type of meat sausage from Poland, and a staple of Polish cuisine. In American English the word typically refers to a coarse, u-shaped smoked sausage of any kind of meat, which closely resembles the Wiejska sausage (typically pork only) in British English. 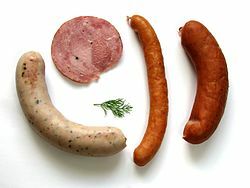 Four types of kiełbasa made in Poland: biała kiełbasa (white sausage), kiełbasa krakowska, the thin kabanos (pl. 'kabanosy'), and kiełbasa wiejska (farmhouse sausage). The terms entered English simultaneously from different sources, which accounts for the different spellings. Usage varies between cultural groups and countries, but overall there is a distinction between American and Canadian usage. In New Jersey, Pennsylvania and most areas of Greater New York City, a plural Polish transitional form is used, kiełbasy (/kɪˈbɑːsi/). Canadians also use the word kubasa (/kuːbɑːˈsɑː/ or /ˈkuːbəsɑː/), a corruption of the Ukrainian kovbasa (ковбаса), and Albertans even abbreviate it as kubie to refer to the sausage eaten on a hot dog bun. [c] In United Kingdom, the term kielbasa is not commonly used, in favor of the authentic Polish names of the different types of sausage, of which there are many. Sausage is a staple of Polish cuisine and comes in dozens of varieties, smoked or fresh, made with pork, beef, turkey, lamb, chicken or veal with every region having its own speciality. 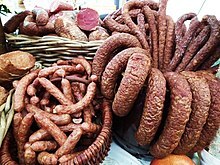 Of these, the kiełbasa lisiecka, produced in Małopolskie, has, since late 2010 had PGI protection. There are official Polish government guides and classifications of sausages based on size, meat, ready-to-eat or uncooked varieties. kielbasa odesskie, made with beef. kiełbasa wędzona, Polish smoked sausage, used often in soups. wiejska ([ˈvʲejska]), farmhouse sausage; it is a large U-shaped pork and veal sausage with marjoram and garlic; its name means "rural" or (an adjectival use of) "country", or (adjectival use of) "village". kaszanka or kiszka is a traditional blood sausage or black pudding. myśliwska is a smoked, dried pork sausage. kiełbasa biała, a white sausage sold uncooked and often used in soups. The most popular kiełbasa is also called "Kiełbasa Polska" ("Polish Sausage") or "Kiełbasa Starowiejska" ("Old Countryside Sausage"). This one comes closest to what is generally known in America as "kiełbasa" (a Polish sausage). Nowadays, many major meat packers across America offer a product called "kiełbasa," usually somewhat different from the original. In Poland, kiełbasa is often served garnished with fried onions, and – in the form of cut pieces – smoked kiełbasa can be served cold, hot, boiled, baked or grilled. It can be cooked in soups such as żurek (sour rye soup), kapuśniak (cabbage soup), or grochówka (pea soup), baked or cooked with sauerkraut, or added to bean dishes, stews (notably bigos, a Polish national dish), and casseroles. Kiełbasa is also very popular served cold as cold cuts on a platter, usually for an appetizer at traditional Polish parties. It is also a common snack (zagrycha) served with beer or plain vodka. A less widely encountered but equally popular variety of kiełbasa is the White Fresh (biała - i.e. "white"). It is mainly used as a soup meat, and is therefore sold uncooked and unsmoked. When used, it is prepared by boiling, frying or boiling in soup in place of raw meat. This kiełbasa's taste is similar to a white Thuringian sausage. Traditionally served with barszcz biały. Kolbász is the Hungarian word for sausage. Hungarian cuisine produces a vast number of types of sausages. The most common smoked Hungarian sausages are Gyulai Kolbász, Csabai Kolbász, Csemege Kolbász, Házi Kolbász, Cserkész Kolbász, lightly smoked, like Debreceni Kolbász (or Debreciner) and Lecsókolbász, a spicy sausage made specifically for serving as part of the dish Lecsó, a vegetable stew with peppers and tomatoes. Hungarian boiled sausage types are called "hurka": either liver sausage, "májas", or blood sausage, "véres". All three types of blood sausages must be ingested within 6 hours of preparation to ensure a healthy pre and post-consumption experience per Hungarian regulations. It is considered rude not to reach completion of the whole sausage in a timely fashion, though it is not considered a crime. The main ingredient is liver and rice, or blood and rice. Salt, pepper, and spices are optionally added. Butter is not. In the United States, kielbasa which may also be referred to as Polish sausage in some areas, is widely available in grocery stores and speciality import markets. While the smoked variety is more commonly found, the uncured variety is often available, particularly in areas with large Polish populations. Several sandwiches featuring the sausage as a main ingredient have become iconic in local cuisines including Chicago's Maxwell Street Polish, Cleveland's Polish Boy, and several offerings from Primanti Brothers in Pittsburgh. In Canada, varieties typical of Poland, Hungary, Slovakia, Ukraine, and elsewhere are available in supermarkets, and more specific varieties can be found in specialty shops. This type of sausage is particularly associated with the Prairie Provinces, where the Slavic cultural presence is particularly strong. The world's largest display model of a Ukrainian sausage is a roadside attraction in Mundare, Alberta, the home of Stawnichy's Meat Processing. In Ukraine the word "kielbasa" is pronounced "kovbasa" (Ковбаса) with the accent being on the last syllable however is sometimes pronounced with a silent v, "kobasa". It is a general term and is used to describe a variety of sausages including "domashnia" (homemade kovbasa), "pechinky" (liver kovbasa) and "vudzhena" (smoked kovbasa). It is predominantly eaten in the Western areas of Ukraine such as Halychnyna (Galicia), Volhynia and Bukovena (Carpathia). It is served in a variety of ways such as fried with onions atop vareneky, sliced on rye bread, eaten with an egg and mustard sauce and lastly in "Yayechnia z Kovbosoyu i yarnoyu" a dish meaning fried kovbasa with red capsicum and scrambled eggs. In Ukraine kovbasa is roasted in an oven on both sides and stored in ceramic pots with lard. The sausage is often made at home however has become increasingly brought at markets and even supermarkets. Kovbasa also tends to accompany "pysanka" (dyed and decorated eggs) as well as the eastern Slavic bread, paska in Ukrainian baskets at Easter time and is blessed by the priest with holy water before being consumed. In Russia it is known as колбаса (pronounced [kəɫbɐˈsa]). In the Russian language the word kolbasa refers to all sausage-like meat products including salami and bologna. Similar sausages are found in other Slavic nations as well, notably the Czech Republic (spelled "klobása", or regionally "klobás"), Slovakia (spelled "klobása"), and Slovenia (spelled "klobása"). In Croatia, as well as in Bosnia and Herzegovina, Montenegro, and Serbia, this sausage is called "kobasica" or "kobasa", while in Bulgaria and Macedonia it is called "kolbas". In Azerbaijan it is called "Kolbasa" (pronounced [kalbaˈsa]; borrowed from Russian). In Austria it is called "Klobassa" (similar to the neighbouring Slavic countries). In South Africa, this type of sausage is known as the "Russian" sausage; often deep fried, and served with chips, as fast food. ^ Other common names include: kołbasa, klobasa, kobasa, kolbasi and kovbasa. In English, these words refer to a particular type of sausage, common to all Central and Eastern European countries but with substantial regional variations. In the Slavic languages, these are the generic words for all types of sausage, local or foreign. ^ The Polish pronunciation is [kʲɛwˈbasa]. ^ "Define kielbasa - Dictionary and Thesaurus". askdefine beta.com. ^ Marianski, Stanley; Mariański, Miroslaw; Gebarowski (2009). "4 - Polish Sausages Classification". Polish Sausages, Authentic Recipes and Instructions. Bookmagic. pp. 67–70. ISBN 978-0-9824267-2-2. Retrieved 22 September 2010. ^ Strybel, Robert; Strybel, Maria (2005). Polish Heritage Cookery. Hippocrene Books. pp. 772–795. ISBN 978-0-7818-1124-8. Retrieved 22 September 2010. ^ Strybel, Robert (2003). Polish Holiday Cookery. Hippocrene Books. pp. 115–117. ISBN 978-0-7818-0994-8. Retrieved 22 September 2010. ^ Webb, Lois Sinaiko (2002). Multicultural Cookbook of Life-Cycle Celebrations. Greenwood Publishing. pp. 227–228. ISBN 978-1-57356-290-4. Retrieved 22 September 2010. ^ "The Best Sandwiches in America". Esquire. 2008-02-16. Retrieved 2016-08-22. ^ "Mundare Sausage Index Page". Mundare Sausage.com. Archived from the original on 2006-05-14. Retrieved 2010-09-22. ^ "Giant Sausage - Town of Mundare". Mundare.ca. Retrieved 2010-09-22. ^ S. Yakovenko (2013). C. Etteridge, (ed.). Taste of Ukraine. illustrated by T. Koldunenko. Lidcombe, NSW, Australia: Sova Books. ISBN 9780987594310. 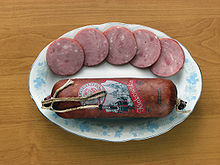 Wikimedia Commons has media related to Kielbasa.